Japanese castles are beautiful and very different from western castles. Ususally I read Osprey primers either for entertainment or as memory refreshers and individual booklets seldom present information with which I'm completely unfamiliar with. For that reason, I am perhaps not the best person to 'judge' those publications, which are intended as introduction to different topics in military history and technology. In this case however, I am exactly the intended 'audience' - before reading 'Japanese Castles 1540-1640', I had no knowledge whatsoever of the subject matter. 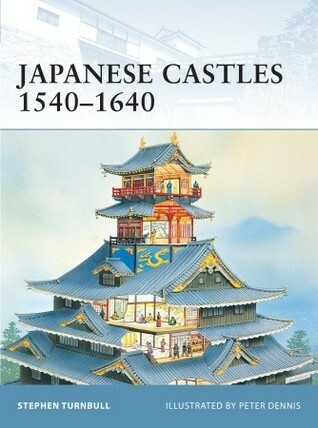 And as a complete 'novice' I am happy to report that this publication is a wonderful introduction to japanese castles of late medieval period. Stephen Turnbull manages to cover a wide variety of subjects associated with those unique fortifications - evolution of their architecture as well as the reason for that development, how they were constructed and maintained, their role in peace &war and finally how they were defended and attacked. Supported by usual high quality graphics consisting of photographs and absolutely geogrous color plates (some of them covering two pages), this volume must be recommended to anyone with interest in subject matter or in military fortifications in general. This book was detailed, educational, entertaining and had very good pictures and illustrations. When I think of an Osprey publication this is the style of book I expect. Great job. Stephen Turnbull - Stephen Richard Turnbull is British a historian specializing in eastern military history, especially the samurai of Japan. His books are mainly on Japanese and Mongolian subjects. He attended Cambridge University where he gained his first degree. He currently holds an MA in Theology, MA in Military History and a PhD from the University of Leeds where he is currently a lecturer in Far Eastern Religions. He has also written a number of books on other medieval topics.